Total Lawn and Landscape Care from professionals you can trust. Your lawn is the first thing people notice when they visit your business, but maintaining it can be a hassle and time consuming. The ACS team is trained to boost your property’s curb appeal and improve your property’s overall health and functionality. Whether you are wanting to maintain your business' property, we are your one-stop-shop for your lawn maintenance needs – From regular scheduled maintenance appointments (mowing, pruning, tree and shrub care, etc.) to sprinkler/irrigation installation and service, to landscape maintenance and installation. We can meet both your everyday needs and larger projects. We also provide seasonal services such as flower displays, yard clean up, and snow removal services. Enjoy peace of mind while you are at work, running errands, or running your business, and let our professionals help you maintain your lawn and assist you with your landscaping project. You’ll be glad you did. 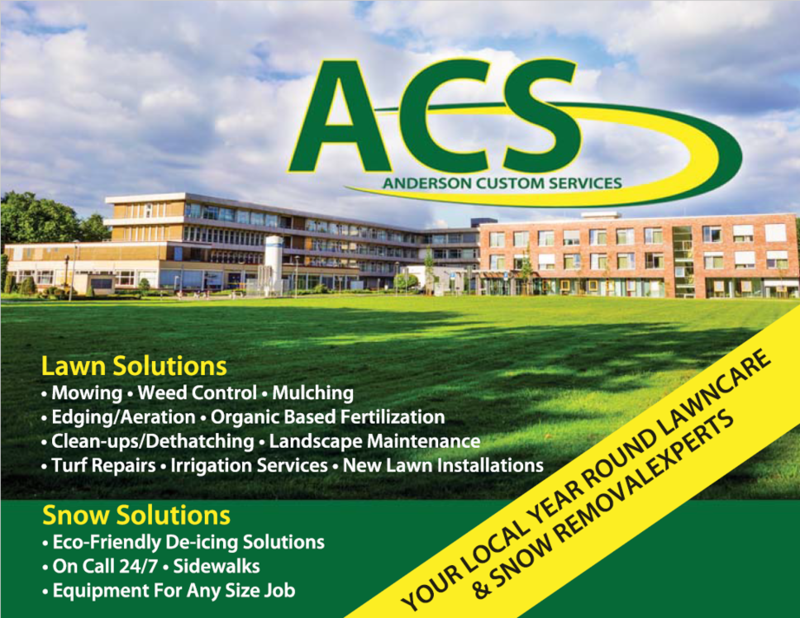 ACS saves you time by offering traditional lawn care services such as mowing, edging, and trimming. We also provide core aeration, seeding, and sod installation. Learn about our Lawn Care services and how we can maintain your lawn. Save time and money with an automatic sprinkler system – ACS will manage all of your irrigation needs, from design and installation to regular maintenance service. Sit back and relax as we create your dream lawn and landscape. Our professional landscapers will create the perfect seasonal display and clean your yard. We will also assist you in snow removal to protect your customers.